THE beauty of the County Down coastline has been captured by photographer Nigel Jamison who will be showing his photographs in an exhibition in the Down Arts Centre. 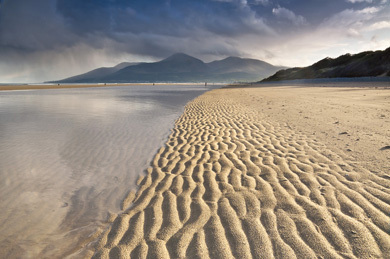 Nigel, a graphics designer by profession, has been bitten by the photography bug and for the past year has worked on a stunning portfolio of images of the beautiful County Down coast. Nigel’s exhibition ‘The Coast of Down’ will run from Friday 1 February – 23 March at the Down Arts Centre, Downpatrick. Nigel Jamison grew up in Ballygowan and is a former pupil of Saintfield High School. He studied at the University of Ulster and obtained a BA (Hons) in Visual Communication. He said: “Upon leaving Art College 30 years ago, I started work in the world of Advertising. I have worked for some of the largest Advertising Agencies in Northern Ireland in various capacities from Junior designer right through to Creative Director and am currently employed in the position of Head of Design with Genesis Advertising in Belfast, who I have been with for the last 13 years. “During my career, I have had the opportunity to work with some of Ireland’s best photographers and cameramen and my interest in photography grew on the back of this. I have Art Directed photographic shoots and commercials for Television.Over the years I have worked fro many top companies such as Spar, Dale Farm, NIE and the First Trust Bank. I have watched and learned from these people, and I have learned what makes a good photograph and when I started to take an interest in taking photographs for myself, I was able to bring that knowledge to my hobby. “My equipment is basically Nikon cameras and lenses, and I shoot in such a way that I try and get the photograph as near as possible to what I want and only use filters when necessary and try and do the minimal amount of Photoshop work such as dodge and burn and improving colours. I try and capture the feel of a scene, and I don’t want to be taking picture postcard type of images. At the start and end of the day there is a golden hour about a half hour either side of sunrise and sunset and these are prime times top take photographs. The quality of light is much different from that in the winter and you just have to work with what you have. 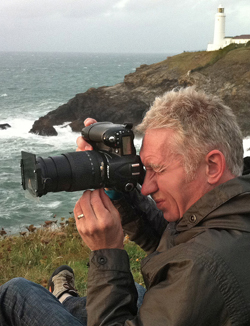 Nigel Grimason at work on his photographic seascapes. “My wife Linda graduated in Textile Design and she is a qualified Art teacher, so we are a family blessed with creative skills. This has afforded me the support I needed when I decided to push my hobby a little further and looked to secure an exhibition of my work. “Last June, one of my photographs of Trevose Lighthouse in Cornwall, was published in Digital Photo which is the UK’s largest selling photographic magazine. The editor commented that ‘I had a real feel for coastal shots’ and this was what prompted me into thinking that I should share my work with a wider audience. “I immediately started to think about a subject that I could work to and also about a way of presenting it. A short time later, I was taking some shots at dawn at St. John’s Point, near the village of Killough. St. John’s Point is a very atmospheric place and is always interesting. It was while I was standing on the rocks facing the sea and waiting for the dawn, with the light from the great lighthouse swinging around above me, that I hit upon the idea of a study of the coast of County Down, with a view to a possible exhibition. “Geographically, as I live between Crossgar and Killyleagh, the coast of Down is all within reasonable travel distance for me, and is particularly relevant, as I have lived in County Down all my life. I contacted the Down Arts Centre regarding a possible exhibition and after sending along some sample images I was offered an exhibition for January 2013. Nigel is also available for commissions and can be contacted via his website www.nigeljamisonphotography.com where his full range of photographs can be viewed and are also available to purchase.